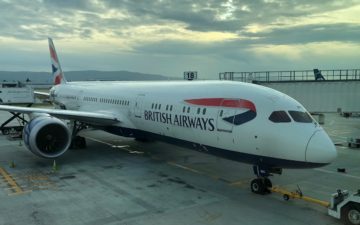 In April we first learned that British Airways plans on refreshing their business class (Club World) product, which is long overdue. As far as I’m concerned, British Airways offers one of the worst fully flat business class products of any major airline in the world, both in terms of the hard and soft product. So I’m happy to see that British Airways is making a big investment in their premium experience, which also includes introducing Club Europe on domestic UK flights, new lounges, a new First Wing at Heathrow Airport, wifi on their short-haul and longhaul flights, etc. 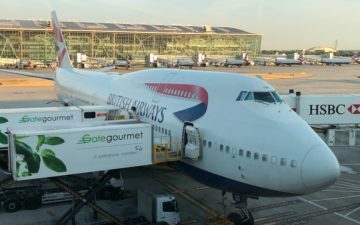 While British Airways will be rolling out a new Club World seat in 2019 that features direct aisle access from every seat, they’re improving their soft product in the meantime. 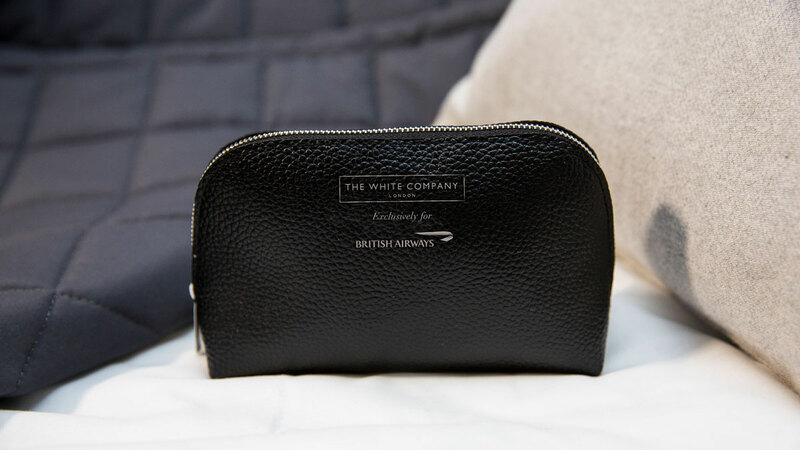 Starting later this year, British Airways will be partnering with The White Company to supply bedding and amenity kits for their Club World cabins. These will be available to New York JFK as of “later this year,” and will be extended to other routes in 2018. However, in the meantime British Airways is moving forward with their improved catering. 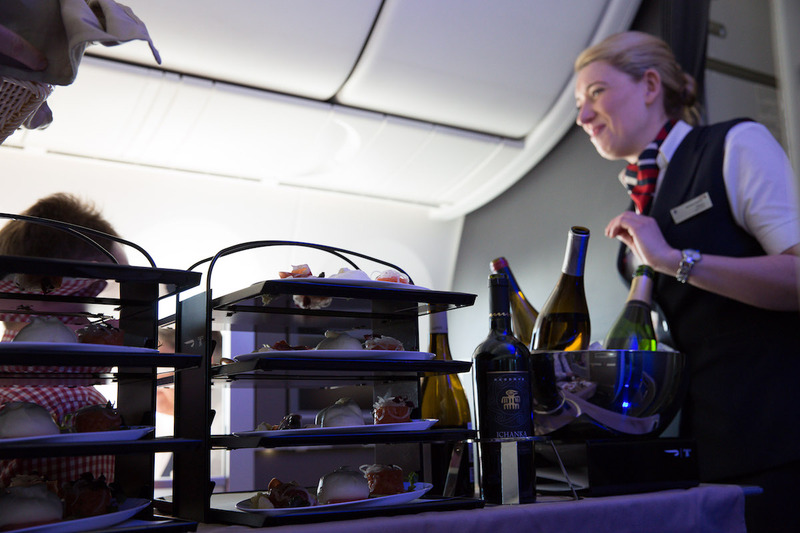 As of September 1, 2017, British Airways will be rolling out their new DO&CO “restaurant-style dining experience” on flights between London Heathrow and New York JFK. With this new program, passengers will be able to select their choice of starters and desserts from new display trolleys, and they’ll also offer new table settings. The carefully curated wine selection will feature white wines and Champagnes presented on top of the trolleys in large, silver wine coolers, while regiments of red wine bottles stand alongside them. The wine menu includes a Bourgogne Chardonnay 2016, Patriarche Père et Fils from Burgundy, a Tiki Sauvignon Blanc 2016 from Marlborough, a Las Olas Malbec/Bonarda Reserve 2014 from the Famatina Valley in Argentina and a Reata Three County Pinot Noir 2013 from California. The champagne options are Champagne Henriot Brut Souverain NV, Champagne de Castelnau Brut Réserve NV and Champagne de Castelnau Brut Rosé NV. As much as I can be critical of British Airways, I’m a huge fan of DO&CO, as I’ve had nothing but good experiences with the airlines that are catered by them. So I’m hopeful that this will represent a very nice improvement both in terms of the presentation, and also in terms of the food quality. This is definitely a step in the right direction for British Airways. Of course this doesn’t change the actual quality of the crews, some of which are great, and some of which are awful. Hopefully most crew are proud and excited to offer a better product, rather than frustrated at having to do more work. I also hope that British Airways caters enough so that they don’t constantly run out of food. I’ve often had issues getting my first choice of appetizer or main course on British Airways, so with even more options, I see that being a big issue. I’ll see if I can fly British Airways out of New York in the coming weeks to test out the new soft product. Too bad the new bedding won’t be available until later this year. Its a joke? Improvement the very common industrial burrata and tasteless tomatoe salad, cafe de Paris sauce ( are we still in the 60s), lemon tart or fresh stawberries in september the season is finished. This new menu sounds old and very indifferentfor J class. Lucky, have you been to the Do&Co hotel in Vienna? they also have a great bar and restaurant, right at Stephansdom. Why bother flying BA again? You already know you’ll leave an overwhelmingly negative review as your mind is clearly already made up on the airline (and whilst quite a lot of it is indeed valid criticism these days, some of it seems to just be clickbait and / or a slightly spiteful excuse to have something negative to write). The main issue to me is your reviews often exhibit little understanding of how business travelers fly or what they are looking for, which I suppose arguably makes some sense as your reviews are clearly tailored to points collectors who generate almost all of your website’s revenue. This does, however, mean you totally ignore the main users of the premium cabins you review and helps to explain how products like BA’s current Club World survive and indeed are highly profitable. Almost every time you review an ‘airline’ you base it solely on a product (often the best one) they operate on select routes. Yes, AA’s 77W J class *is* excellent (I flew the mini-cabin over BA J back from JFK just yesterday actually). But they operate the 77W on, what, about 10 routes in total? If I want to fly TATL AA direct to a lot of European destinations, I’m stuck in a seat that’s not even lie flat! When was the last time you reviewed AA’s quite common non-lie flat J product? Ditto UA, ditto AF, ditto LH and so on. Yes, their best product may be better (in some cases *much* better) than BA, but when you don’t have the option of adding an extra 4 hours to a 6 hour flight to route via somewhere else, sometimes BA can genuinely be the best option (increasingly less so, I grant you). Again, you also ignore the fact that BA’s on board J soft product is largely tailored to business travelers rather than those looking to ‘enjoy’ the premium experience as a one off thing – e.g. whilst the AA 77W hard product is light-years ahead of Club World, on an Eastbound TATL flight they don’t offer food very quickly on board, lights take forever to be dimmed, etc. The BA product is in contrast all about getting you to sleep as quickly as possible. And I say all this as someone who is themselves highly critical of BA (and often avoids them for long haul where a better option is possible). The thing avgeeks always seem to ignore is the importance of consistency. I fly more than I want (I know that’s heresy…), for work, and when I’m sitting knackered at the gate just desperate to be at home, I don’t want to gamble on whether I’ll get Airline X’s brand-new and world-beating J class (only in 2% of their planes), or have an equipment swap to something I would have turned my nose up to about 20 years ago. BA – for all their many, many faults – has exactly the same lie-flat bed on every single longhaul flight. Every one. With them I will never get stuck with an angled seat. Do I fly them if there’s a better alternative? Hell no (and, despite what I just wrote, I’ll be checking out the Qsuites in a couple of weeks). But give BA credit where it’s due. AA basically has no TATL routes without lie flat seats today. All of the 772s have been retrofitted, ORD has moved exclusively to the 787-8, the 75Ls are done. the only plane you have to worry about is the 763, usually from DFW, and there are only 6 of these in the entire system. Any idea if this service will be offered on other routes? Great, no different to previous menu with it’s lack of healthy and abundant plant-based options. So I’ll pay over $2000 for a 9 hour flight nibbling on salad the whole time. Real progressive BA. Not to mention the carbon foot print of a meat and dairy diet. Clearly BA has no interest in social responsibility. Trent – why not just order a Vegetarian or Vegan meal? @mackie yes rolled out next year across network. @lucky you are aware that DO&CO have been catering BA for a number of years on a number of routes and exclusively out of LCY IIRC. @Tom I’m with you the whole way. I suffered the misfortune of a 77W downgrade 18 months ago to a 772 with angle flat on American. Awful. Truly awful. Crew were about 80 (no I’m not AAB in disguise! ), seat awful and food vile. Heck AA can’t even offer consistency on the supposedly amazing ice cam sundae. BA has the world best premium economy seats in Business class. I hope one day someone adopt the seats in Premium Economy cabin! @Tom I agree this website is not fully for business travellers. It is only a website for information and opinions. It’s not a textbook. BA Club World window seats are among the most private in J in the industry. ‘worst in the world’ seems a bit harsh. We all know that Ben hates BA. We are tired of reading about his BA bashing…. Is it anything to do with his German descent??? This is a only a trial and BA will ultimately fail this one, since you can’t predict what Alex Cruz will do to his product investment. I’ll be on BA in first on October 4 and 8. I’ll check out the club offering. Yes the food on BA was … well quite variable. But again, the same applies to LH, LX and the likes. Generally I like Do&Co. It’s much better than Gategourmet or SkyChef. But what about the return catering? Not from JFK, where Do&Co also operates, but all the other destiantions? BA has nowhere to go but up in the food arena so I’m sure this will be better. But the bigger issues are being ignored – their substandard hard product with the 8 across seating in J and their surcharges on award flights. If surcharges came down the AA brigade would be all over, clambering for seats…you all monopolise Cathay redemptions as it is. Off topic but could someone please explain the reason why Americans call main course an ‘entree’. As I french speaker I find this term terribly confusing and as an english speaker, I am totally baffled. I flew on a domestic route with BA yesterday, in Club Europe, as I have several times since Spring this year. This article gives the impression the service has not yet been launched. Personally I think BA have a lot of work on their hands if they want to have a hope of competing with their competitors. I first flew their First Class product in 2001 and was actually quite impressed, at the time it was excellent. The seat and food was very good and they gave away a free hard Molten Brown sponge bag packed full of different lip balms, moisturisers and the usual flight aids. I can’t understand why they chose to actually replace this with something far worse when the competition was improving. I think one of the reasons is that they have a very good business to business team so most big firms have accounts with them, however, I simply instructed my PA/travel department not to book my flights with anyone but BA (and the US-based carriers). I have heard from my brother, who is 6’7″ tall, that their Club World (business class) product is awful and he can’t use them because it’s too uncomfortable. He suggests that they are simply cutting corners to make more money. They’ve got to do more than tickle round the edges if they want to win passengers back. That’s the problem: BA has a near-stranglehold on slots at LHR, which generates more premium traffic than pretty much any other airport. And BA’s hefty network from there means they really don’t have to try very hard – why do you think IAG is making massive profits? So, if there’s no competition, and BA is selling out the current product, why would it fritter money away? As it happens, there have been some signs recently that what competition there is at LHR is now beginning to bite a little. The investment in soft product and, later this year, in direct aisle access CW seats on the new A350s, seems to be evidence of that. I’m OWE, but where I have an alternative I do take it: a trip to Taipei last month gave the ME3 some of my travel budget, and Virgin has been taking some TATL money, too (though last month I got stuck in the seat right next to their dumb bar, where drunk yobs shouted at each other the whole night, the supplies of free booze never flagging. Thanks, Virgin – a sleepless night for me. And no more of my cash to you). @ Michael – thank you for taking the time to post the link which is most interesting. I guess the main meal is the entree for dessert! @Trent if youre so worried about your carbon footprint, you should technically be flying economy, or better yet, not at all. Stop being such a hypocrite.